Just to the east of Leeds in West Yorkshire is the small village of Towton. This village sprang to fame on 29 March 1461 with what has been described as the bloodiest battle ever fought on English soil. The Powerless and frightened King was forced to agree, however his queen, Margaret of Anjou, being of sterner stuff was not happy with the King’s and her son being passed over. She fled first to Wales and then to Scotland, rallying her supporters along the way. (She was given support by Scottish Queen and Regent Mary of Guelders, in exchange for Berwick on Tweed). York marched north to counter this threat and met with the Lancastrians at the Battle of Wakefield. The Yorkist army was surrounded and destroyed, The Duke of York was killed along with his son Rutland and Salisbury’s son and son-in-law. Salisbury was captured the next day and also killed. The victorious Lancastrians marched south defeating the remains of the Yorkists under Warwick at the Second Battle of St Albans but failed to gain access to London. The mantle of the York claim now fell on York’s eldest son Edward, Earl of March. After winning a battle at Mortimer’s Cross on the welsh border, he marched to London and joined with the remnants of Warwick’s forces and was proclaimed King Edward IV. There were now two rival “Kings” of England. 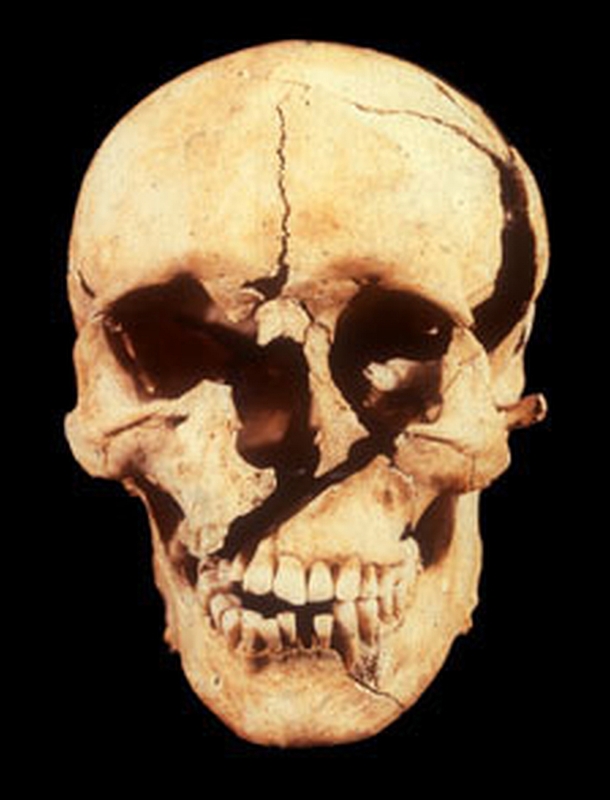 Skull from a victim of the Lancastrian massacre following their defeat at the Battle of Towton, showing sword slash across the front of the face. The Yorkists now marched North to attempt to remove the Lancastrians from York. After a skirmish as they crossed the River Aire at Ferrybridge, the Yorkists camped overnight at Sherburn-in-Elmet. The Lancastrians Marched to Tadcaster and made camp there. Dawn broke the next day to dark clouds and strong winds and although it was Palm Sunday, the two armies prepared for battle. Contemporary sources claim the armies were huge, up to 200,000 in the Yorkist Army and even more in the Lancastrian though modern estimates put the combined figure at about 50,000. Three quarters of the English peerage were present at the battle.